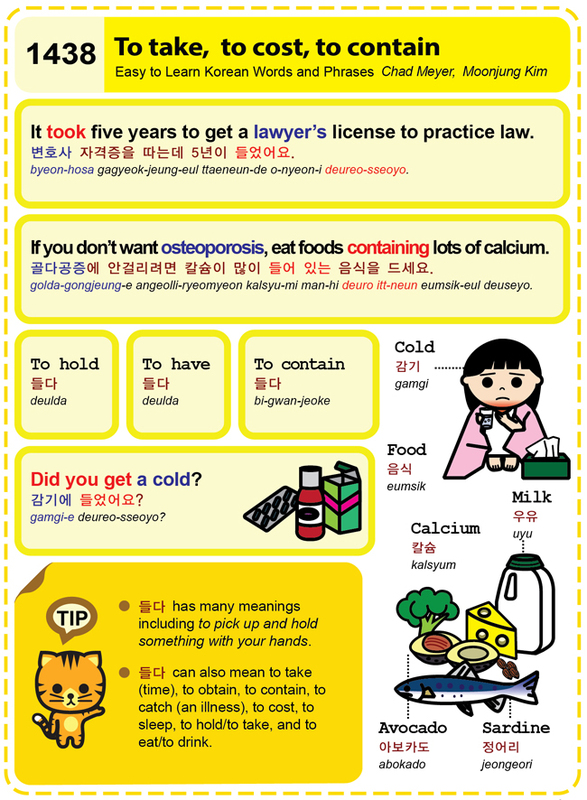 Easy to Learn Korean 1438 – To take, to cost, to contain. This entry was posted in Series and tagged and to eat/to drink, avocado, calcium, contain, cost, deulda, Did you get a cold?, eat foods containing lots of calcium., food, gamgic, If you don’t want osteoporosis, It took five years to get a lawyer’s license to practice law., milk, old, sardine, to catch (an illness), to contain, to cost, to have, to hold, to hold/to take, to obtain, to pick up and hold something with your hands, To sleep, to take, to take (time), uyu, 감기, 감기에 들었어요?, 골다공증에 안걸리려면 칼슘이 많이 들어 있는 음식을 드세요., 들다, 변호사 자격증을 따는데 5년이 들었어요., 아보카도, 우유, 음식, 정어리, 칼슘 by easykorean. Bookmark the permalink.